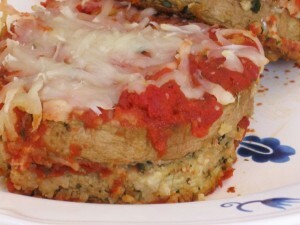 Baked Eggplant Parmesan | Great gluten free recipes for every occasion. Gluten free or not, that is some NICE lookin’ eggplant. I made my own breadcrumbs because some gluten free bread had floated to the back of the refrigerator & I refused to let it go to waste. I just fired up the food processor & pulsed the heck out of it. They ended up coarse because the bread was more stale than I’d care to admit. But really any sort of breadcrumbs will do. This is super simple, & super inexpensive. It’s healthy, too, since it’s baked not fried. I have make fried eggplant, & it is delicious, but it’s a whole endeavor. And really, this is delectable, baked. 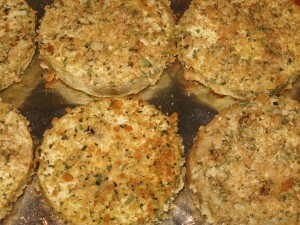 Coat the slices of eggplant in the egg mixture, then press both sides into the breadcrumbs. Place each slice on a greased, rimmed baking sheet (I line with foil for easy cleanup), & bake at 400 degrees until soft to the touch & golden brown, 15 -20 minutes. Flip over the slices halfway through. I took the leftover egg mixture & breadcrumbs I had, & made Spinach Balls. Jealous? Oh come on. I’ll post the recipe eventually. Layer up eggplant parmesan in a glass 9″x12″ baking dish like so: Cover bottom of dish with tomato sauce, then place one layer of eggplant slices, cover each slice with sauce, and top with shredded cheese. Then the next slice of eggplant, sauce again, and top with the rest of the shredded cheese. Bake for 15-20 minutes at 350 degrees until cheese is melted & sauce is bubbling. That’s it. No sweating the eggplant, no messy frying, no coronary artery disease. You like? Let me know! Have you tried this recipe for chicken parmesan? Could this recipe be adapted by changing cooking times/temp? Love your website by the way…us less cooking savvy celiacs need all the help we can get! Definitely. You could definitely use this method for chicken parmesan. When I make chicken parmesan, if I’m feeling industrious, I shallow fry the chicken after breading it, and then assemble it with sauce and cheese and bake it essentially just to melt the cheese. But you can also just make chicken parmesan by breading it, and baking it with sauce in a single layer in a pan at 375 degrees until it is cooked through (about 30-40 minutes), then covering it with grated cheese and baking a few minutes more. Easy Peasy. If anything about this is unclear, post back and I’ll walk you through it! I enjoy so much the personal touch you sprinkle into your recipes. I feel such warmth and whimsy from you and enjoy those qualities. Your way reminds me of a dear, special friend of mine who passed a couple of years ago. Ok, enough rambling! The main reason I’m writing you is to thank you for the hope. My husband was recently diagnosed with Celiac. Sigh! I’m an intuitive cook, a bit of a foody, and do not really enjoy fussy cooking. I first did extensive research to educate us and since have been scouring the web in search of recipes similar to my style of cooking — and I have found that here. Most of the previous sites I found are trying to sell ready-made-food, which I rarely feed my family because I can not suffer the guilt. So why would I start feeding them out of a package now. Thank you so much for your generosity and giving nature: you probably could make money off of these, but you don’t. I find that commendable. No guilt! Bake it and release the guilt! I love fried food as much as the next girl, but baking instead can often mimic many traditionally fried foods, and it’s much less messy and cheaper, to boot. I’m so glad you’re finding the site helpful. You can eat gluten free on any budget. Thanks so much for this site. I’ve been GF for two years now. It’s still challenging some days, and this site is SO helpful, especially on a grad student budget. This eggplant is fantastic, and has the added bonus of reducing my guilt about eating eggplant parm in the first place. Thanks for the kind words. It is a tried and true vegetarian recipe. I thought the author did a good job on the Times article, but I do understand what you mean about the lack of optimism. I try to emphasize how easy it is to bake, cook and eat gluten free and have a full, happy life, but I do think that the dark underbelly of the diet is how expensive it can be. It should be part of the discourse, and until now it really hasn’t been. So I’m grateful she wrote the article (and happy for my mention in it of course). Hi Nicole, Thank you for this recipe. It looks wonderful! I’m a 57-year old vegetarian mom with gluten sensitivity. I avoid sugar to keep the post-menopause 10 pounds off, but am always on the lookout for veggie, fruit, and gluten-free grain recipes. FYI, I found your site through the NY Times article which I thought exaggerated the “hassle” in being gluten free. Of all of life’s challenges, this should only be our biggest! No, celiac disease can’t be remedied by a quick-fix such as a pill, which everyone wants these days, but thank goodness a diet adjustment does! The author should have emphasized the positive, not the negative.